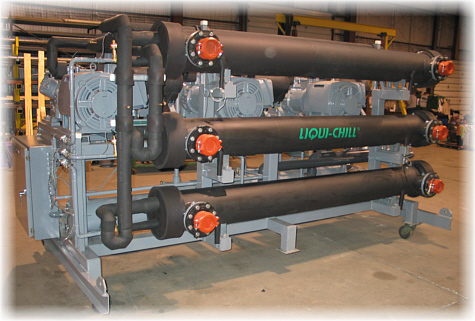 Liqui-Chill Ultra High Efficiency Chillers have computer control of all functions including electronic expansion valve control for precise superheat control. Uses range from ice rinks, institutional air conditioning, industrial processes like plastics manufacturing and food processing equipment cooling. Above: Rear view of a chiller showing three independent chiller evaporators. The above chiller has three independent refrigerant circuits or systems on one frame. Above: Nema 12 control panels with microprocessor keypad display, compressor starter, main disconnect and safety controls.